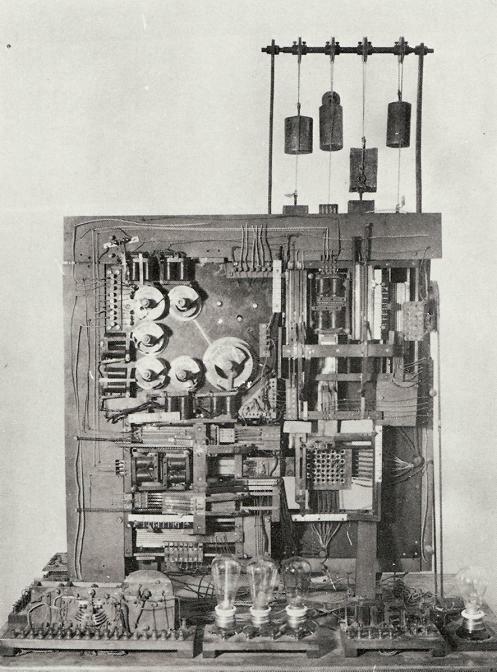 the electro-mechanical KRK solver by Leonardo Torres y Quevedo. In 1910 Torres began (other sources state 1890, or 1901 ) to construct the chess automaton. In 1912 it was able to automatically play a white king (initially on a8) and white rook (initially on b7) against the lonesome black king placed on any square, except 7th or 8th rank. The algorithm was suboptimal, but could win in less than 50 moves against any defense  . It used mechanical arms to make its moves and electrical sensors to detect its opponent's replies. A second, mechanical but not algorithmic improved El Ajedrecista was built by Leonardo Torres Quevedo's son Gonzalo in 1922, under the direction of his father. At the 1951 Paris Cybernetic Congress the advanced machine was introduced to a greater audience and explained to Norbert Wiener  . 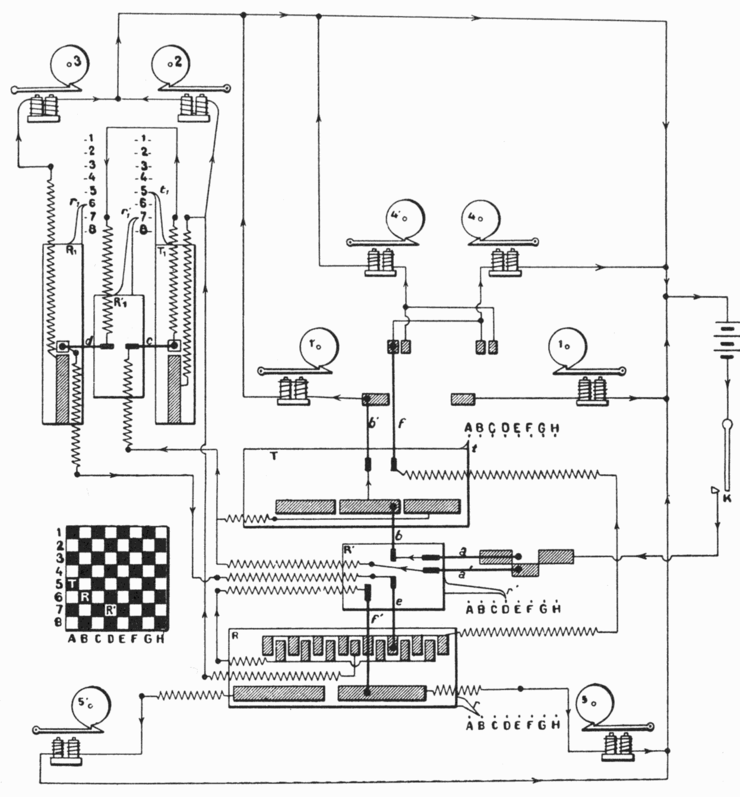 Even if only playing KRK, El Ajedrecista can be considered as the world’s first chess computer, even a dedicated robot able to move its own pieces. It is still functional and can be visited at the Torres Quevedo Museum of Engineering, Institute of Civil Engineering at the Universidad Politécnica de Madrid . During the WCCC 1992, hosted by the Universidad Politécnica de Madrid, the original El Ajedrecista was an exhibit in the tournament hall . Roughly speaking, the movement of white pieces depends on the movement of the black king. Each of the 64 squares of the chess board (8 rows x 8 columns) are formed by three metallic pieces separated each other by an insulating material; the central piece is circular and is connected to the positive terminal whereas the side pieces are triangular and are respectively connected to two conductors, one horizontal and one vertical. The black king has a silver mesh-base that connects the central piece of the square to the triangular ones, thus closing two electrical circuits that move two respective sliding bars, one horizontal and one vertical, until they reach two positions that determine the black king position on the chess board. Similarly, positions of the white king and rook are defined by four sliding bars, two for each of the pieces. When the black king moves into a position, the corresponding sliding bars move and close, by means of suitable contacts, the electrical circuits which act in turn on the white pieces making them move according to the game strategy. The white pieces have a steel ball in their base and are driven by electromagnets, which are placed under the table and suitably activated for each black king position. When a check situation occurs, a phonographic disc pronounces the sentence “check to the king”. When checkmate occurs, the disc pronounces the corresponding sentence and a warning light indicating mate is turned on. In these cases, an electromagnet removes the tension from the board, thus ending the game. The automaton won. 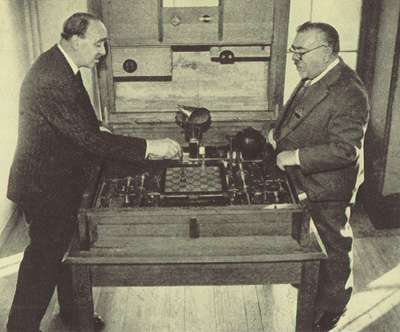 Although the chess automaton function was limited to particular chess endgames, Torres Quevedo proved that further advances in computer technology were possible at a time when the information about “artificial intelligence” was very limited. At the time of this invention Torres Quevedo was President of the Academy of Sciences of Madrid, Spain. Eight electro-mechanical actuators make the robot's own white king (left, right, down) or rook (left, right, down one square, horizontally to a- and h-file) moves and update its internal board representation. They are build using a disc (D) under friction torque of a spindle (O) driven by weights suspended from a cord wrapped around a pulley . The disc has one sawtooth to prevent motion by an pawl unless an electromagnet (E) shortly attracts armature (A), allowing a full disc rotation, running a kind of mechanical microprogram for a specific piece movement. Using vertical and horizontal sliding arms, the robot addresses the origin square, grasps the piece from the board's plug hole, moves it over the target square to reinsert it into the board again. Henri Vigneron (1914). Les Automates. La Nature, pdf from cyberneticzoo.com, Translation by David Levy as Robots in David Levy, Monroe Newborn (1982). All About Chess and Computers. Springer, pp. 14-23, also in David Levy (ed.) (1988). 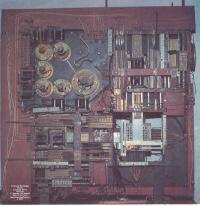 Computer Chess Compendium, pp. 273-278. Universidad Politécnica de Madrid - Museo "Torres Quevedo"
↑ Henri Vigneron (1914). Les Automates. La Nature, pdf from cyberneticzoo.com, Translation by David Levy as Robots in David Levy, Monroe Newborn (1982). All About Chess and Computers. Springer, pp. 14-23, also in David Levy (ed.) (1988). Computer Chess Compendium, pp. 273-278. This page was last edited on 3 April 2019, at 20:19.